New Year's Resolutions: Why are They so Hard to Keep? They were not the first to attempt it, but they were the first to finally achieve it. 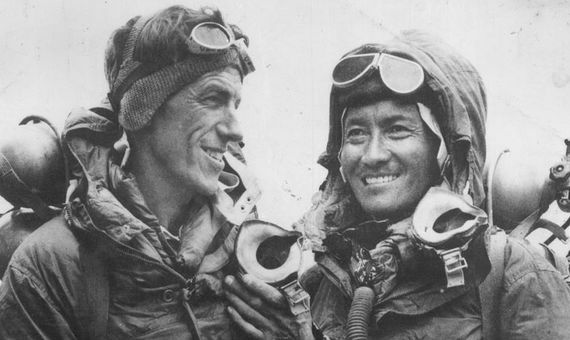 The New Zealander Edmund Hillary and the Nepalese Sherpa Tenzing Norgay reached the highest mountain on Earth, 8,848 metres in height, on the morning of May 29, 1953. Behind them lay 31 years of attempts, in which expeditions from different countries lost 11 climbers while trying to reach the roof of the world, the imposing Everest. It requires an ascent under extreme conditions that, in its final stretch, serves up average temperatures of –35°C and gusty winds that constantly change direction. Since that day in May 1953, more than 4,000 people have reached the peak thanks to their expertise and determination and, also, thanks to the scientific and technical advances that have turned what is still a very hard climb into something more accessible. After a final five-hour climb that pushed them to their limits, with hardly any air in their lungs, Edmund Hillary (1919 – 2008) and Tenzing Norgay (1914 – 1986) reached the top of Everest 65 years ago today. However, they were not alone in the challenge. 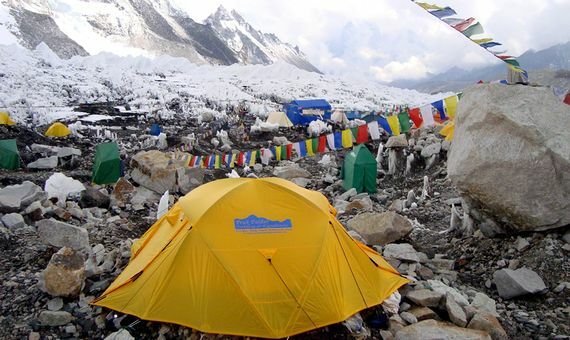 More than 400 people, including climbers, Sherpas, engineers, scientists and the military, had helped to propel them to the top for 90 days: the 43 days that it took to transport 4.5 tons of material from Kathmandu (capital of Nepal) to the base of the mountain, plus the 47 days that they invested in opening a route and setting up the final camp—number 9—at 8,500 metres above sea level. It was there that Hillary and Norgay spent the night before making their final push to the summit. The United Kingdom had been trying for decades to be the first country to conquer Everest. The expedition of 1953, the ninth one for the British in that place in the Himalaya Range, was led by Colonel John Hunt and had all the means available to the country, among them the best climbers of its empire. One of the innovations that they had with them, compared to previous expeditions, was the oxygen system. For the first time they used one that incorporated atmospheric air into the mix that the climber breathed. Although it was not totally airtight (like the closed circuit ones that had been used so far), it was simpler to manipulate and broke down less frequently. Provided with this system, at 11:30am on the morning of May 29, Hillary and Norgay reached the top of the world. As you ascend in height, the pressure of the atmosphere decreases and, with it, that of all the gases that compose it, like oxygen. The higher we are, the smaller the air mass above our heads and, therefore, the less the pressure it exerts on us. This pressure is what allows the lungs to absorb the air passing through the trachea. Above 8,000 metres, in the so-called “death zone”, breathing becomes a very complicated task because the pressure drops to one third of what it is at sea level. From that point on, there is no way for the human body to acclimate to the extreme environment, and it can only be supported for a limited period of time. If an alpinist suffers any accident in the death zone that does not allow them to move on their own, their rescue is practically impossible. The best way to acclimatize is to ascend little by little and spend days at different, ever increasing, altitudes. In this way, the body gets used to the amount of oxygen it needs in an environment different from the one it’s used to. The number of breaths per minute increases in order to get more volume of air in the lungs, the heart rate rises to bring oxygen more efficiently to all the tissues, and the number of red blood cells in the blood multiplies, which increases the body’s oxygen-carrying capacity. Some people find it more difficult to get used to altitude, their body does not acclimate well and they suffer badly from the thin air, with symptoms such as headaches, fatigue and nausea. The difficulty in breathing, the low temperatures and the topography of the terrain means that at more than 8,000 metres an experienced mountaineer must consume three breaths of air for each step. For the Sherpas, natives of the Himalayas, that environment is more bearable. With a very special physiology, their bodies consume oxygen more efficiently than people who inhabit places closer to sea level. Since 2017 we have known that this skill is due to an advantageous genetic mutation whereby they have a unique metabolism. The mitochondria (the energy factories of the cells) of a Sherpa are 30% more efficient at transforming the oxygen from the air into energy, and it does not matter if it is 8,000 metres above sea level or 200 metres. Everest attracts many alpinists of very different profiles, from the oldest person to reach the peak, an 80-year-old Japanese man, to the youngest climber who has managed the feat, an American teenager aged 13. Regardless of one’s age, reaching the top of the world requires time and money: at least two months in the Himalayas and around € 80,000. To attempt the summit there are two possible routes: one that approaches it from the southeast in Nepal (the busiest) and the other from the north in Tibet. During the first 25 years after the accomplishment of Hillary and Norgay, Everest was only summited by 70 climbers. However, by 1999 the 1,000th ascent had already been reached. Currently, there are more than 4,000 people who have succeeded in making it to the summit. All that human traffic has left behind more than 50 tons of garbage, which pollute the environment and could lead to diseases. To try to reduce the environmental impact of this type of tourism, the Nepalese government levies fines of more than €3,000 on climbers who come down without carrying at least 8 kilos of trash. In addition, each May, the Eco Everest expedition heads to the zone to pick up garbage. 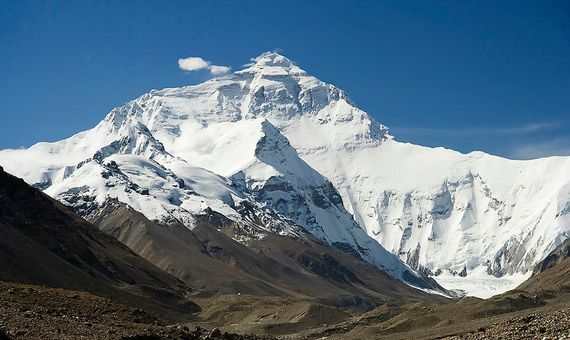 Summiting Everest is a popular tourist activity thanks, in large part, to the scientific and technological advances that allow modern climbers to better withstand the harsh environment. While Hillary kept himself warm with heavy woollen clothes, today’s mountaineers climb more lightly thanks to synthetic layers and down jackets. Their tents have also lost weight. In 1953 they were sewn with heavy canvases, but nowadays they are composed of nylon fabric and flexible carbon fibre rods. In addition to being easier to transport, these materials also provide better protection from low temperatures and strong winds. Currently, more than 95% of climbers use oxygen systems with cylinders that weigh about 4 kilos, while those of 1953 reached 8 kg. What happens to those who don’t return? Almost 300 people have died trying to summit Everest. The routes to the top are littered with bodies that have been frozen at the point where they died. It’s impossible to identify all of them, so the climbers have given them names to use them as reference points. One of the most famous, and one of the first found along the ascent, is known as “The Greeter.” Nicknamed thus for the position of his arms, he has been there since 1997. A year earlier, in 1996, the Indian climber Tsewang Paljor lost his life in a storm. 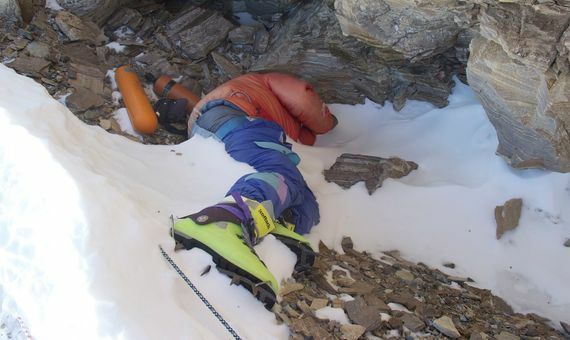 His body, known as “Green Boots”, rests three hours from the summit on the northern route. Along with many others, these corpses point the way to the top of the world.